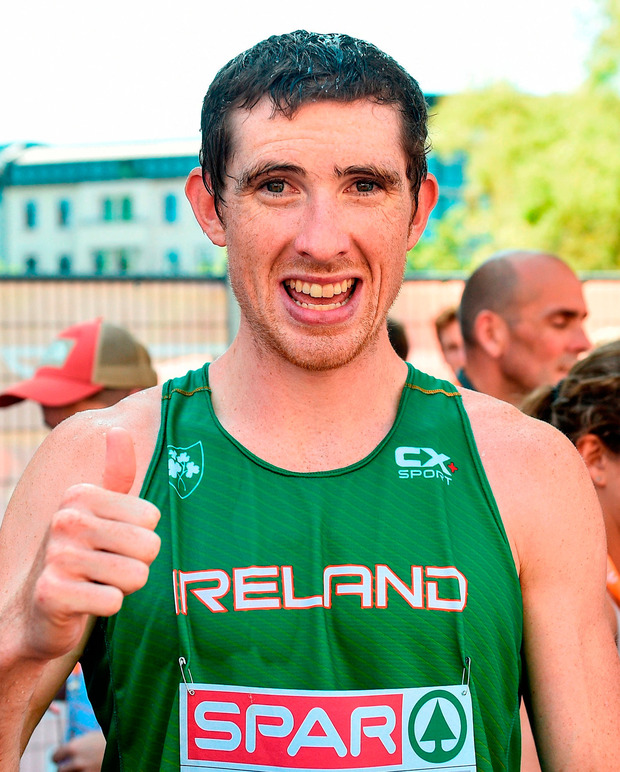 It wasn't his best day, or even a particularly good one, but the sight of Brendan Boyce hunched against a railing in Berlin yesterday told you everything you need to know about him, and indeed the savage struggle that is the 50km race walk. So much investment, so little return, at least for all but a few, and rarely could 19th place in a European Championships have demanded such an extortionate toll. On the wickedly hot streets of the German capital, where temperatures soared well into the 30s yesterday, Boyce threw caution to the hairdryer wind from the start. He passed halfway with the leaders, a decision which made little sense to everyone but Boyce and his advisor Rob Heffernan, who told the 31-year-old that suffering was inevitable, so he may as well take a positive from the race and suffer near the front. Get rich or die trying. "Rather than just going easy and dying I thought I may as well have a pop," he said. "I had to try gain some experience out of the race in some way and I felt that was the best way to do it." There are some events in athletics that can be bluffed, waltzed through to a certain extent with a combination of talent and muscle memory. The 50km race walk is not one of them. In early June, while on a training camp in Italy, Boyce was diagnosed with a stress fracture in his tibia. He took six weeks off, cross-trained himself into oblivion to maintain fitness, then got back walking just a few weeks before Berlin - his grand total mileage for that 10-week spell totalling just north of 200. At the 30km mark the Donegal man was still in the thick of the medal hunt, but by 40km the wheels were starting to come loose, the slow inevitable realisation dawning that there is no substitute for time on the road. "I have to be tough, I have to finish," he recalled telling himself. "I didn't come here to not finish." Like impatient customers in a queue, one by one they filed past by in that final hour, Boyce eventually hitting the finish at Breitscheidplatz with the expression of a squinting, grimacing grinch - 19th in 4:02:14, 16 minutes behind gold medallist Maryan Zakalnytskyy of Ukraine. "That was the toughest race I've ever done," he said, and shortly before he was helped away by Irish support staff he offered one final vow, a promise all that toil would not be in vain. "This is probably my worst championships technically but I can still take something away from it," he said. "If I'm 100 percent you'll see me in the lead group (next year) and hopefully it'll be for 50K, and not 35K."